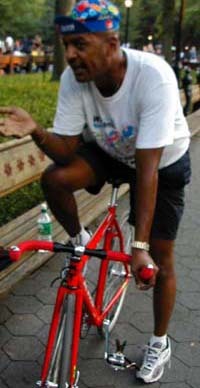 This is a random collection of images of fixed-gear bikes and the folks who ride them around the streets of New York City. The bikes include everything from the humblest street-fixed to the custom-designed pursuit racer and the classic Italian track bike. 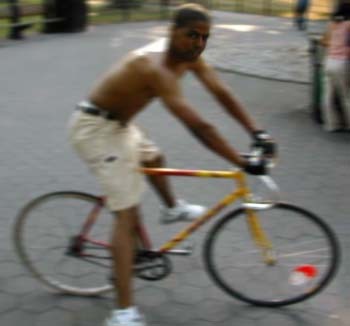 Most of the bikes feature horizontal rear dropouts, steel frames, and no brakes. 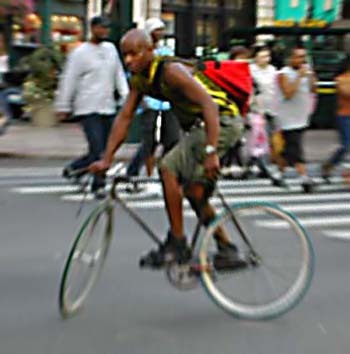 New York City is crowded and hazardous for cyclists. But its lively fixed-gear subculture seems to be growing each year. This tiny group is composed of downtown bike messengers, bicycle activists rooting for a car-free NYC, road-racers who ride fixeds to improve their technique, track racers, and the "old skool"--riders now in their middle age--former racers, messengers and other aficionados who have decades of fixed riding experience and who still love the purity and simplicity of a track bike on the street. So in a given summer month, you'll see new or vintage track bikes from Frejus, Pinarello, Masi, Serotta, Simoncini, Marinoni, Cinelli, Eddie Merckx, Schwinn Paramount, Mercian, DeBernardi, Colnago and others. But it's not all high-end! There's also a spate of new entry level track bikes from Fuji, Bianchi, Cannondale, KHS, Surly, and GT. 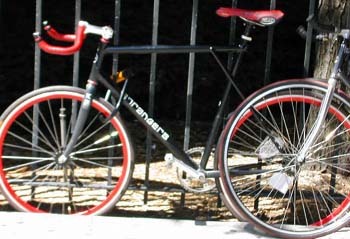 These are ultra-low-maintenance, inexpensive, and too plain for bike thieves, so they're great for messengers. We hope to get photos of all these! Enjoy! Greg Goode wrote FG101, the 63xc.com primer, and runs a website for street fixers.